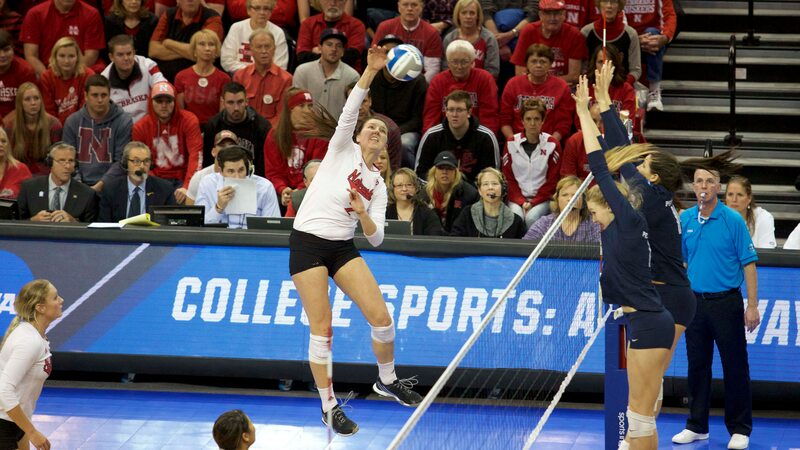 Nebraska outside hitter Mikaela Foecke talks with Andy Katz about the upcoming Nebraska season. Stanford showed the volleyball universe how valuable a great freshmen class can be when it won the national championship with four freshmen starters in 2016. Those four starters — now juniors — are the main reason Stanford is the preseason No. 1 team. However, there are many other roles freshmen can fill. While most freshmen who were highly rated in the 2018 class will likely play in their team’s rotation in some role or another, here are 13 players that could have a major impact as a true freshman in 2018 based on the assumed roles and PrepVolleyball recruiting rankings. Look no further into the No. 7 Florida Gators' second-ranked recruiting class than the top player in the country, Thayer Hall. After coming up two sets short of a national championship in 2017 and graduating four All-Americans, including three of their top four kills leaders, Hall will be a primary contributor immediately for the Gators. Right-side hitter Haley Warner will likely be another top hitter for the Gators, but if they make it anywhere near the championship again, Hall could be the major reason. Replacing All-Americans is nothing new to second-ranked Nebraska, but coach John Cook is stepping into new water trying to replace one with a freshman while defending a national championship. Nicklin Hames, ranked as the top setter in her class and fourth-best prospect, was an Under Armour first-team All-American and will be one of possibly three freshman starters for the Huskers this season. Nebraska still has an All-American hitter in Mikaela Foecke, but Hames’ play will largely determine if they still reign atop the NCAA, let alone the Big Ten. In his 40th season, Russ Rose will need much of his eight-member, top-ranked recruiting class to contribute immediately. Especially Kaitlyn Hord, the third-ranked recruit in 2018, and Serena Gray, 2018’s fifth-ranked prospect. The No. 6 Nittany Lions lost three-time All-American Haleigh Washington in the middle — among other key members — who was the nation’s hitting percentage leader last year and one of the most feared blockers in the country. Being top five recruits, Hord and Gray should have the first crack at filling that void. Eighth-ranked BYU returns its two leading hitters and issues in Heather Gneiting, the sixth-ranked freshman of the 2018 class, to replace Cosy Burnett in the middle. Burnett was the team’s leading blocker last year. In the Cougars' exhibition game last week, Gneiting led the team with five blocks. She could be a difference maker if BYU is to get back to national semifinals for the first time since 2014. The Auburn Tigers haven’t made the NCAA tournament since 2010, but Mica Allison might be the missing piece to end that drought. Allison, rated as the second-best setter and seventh-best prospect, was a member of the 2018 USA junior national team and will start for the Tigers. She recorded 42 assists and five blocks in Auburn’s scrimmage against Georgia Tech. The Tigers might be a sleeper team in the SEC with their top four hitters returning. We're previewing our setting corps today so head to the link below! Tigers open 2018 in #Auburn Arena, Aug. 24, vs. High Point! Taylor Bannister was everything for LSU last season. She led the team in kills and guided the Tigers to their winningest season since 2014 and an NCAA tournament bid. This year, that player might be Whitney Foreman. Entering as the ninth-best prospect, Foreman has stiff competition in the middle with two of the team’s top five hitters last year, but Foreman is another young arm that will be utilized on a team that returns a lot of talent. If No. 23 Purdue wants to compete with the premier programs in the Big Ten, it has to be strong in the middle and at the net. Grace Cleveland could be that player for the Boilermakers. Cleveland, the 13th-ranked player in the 2018 class, likely won’t start in the middle with Blake Mohler returning, but she should see plenty of time in the rotation on a team that has to replace a first-team All-American in the middle, a four-year starter at outside hitter and a three-year starter at setter. There might not have been a team with more roster turnover than the Tar Heels, which opens the door for their top recruit to be the go-to player in 2018. Destiny Cox, the 19th-ranked prospect in the incoming class, is one of nine new players on the roster (five freshmen, four transfers). Cox and junior transfer Skylar Wine will likely be the starting hitters at the pins. Don’t be surprised if Cox leads the Tar Heels in points this season. With all three of their All-Americans returning the fourth-ranked Golden Gophers are a national championship contender. In the back row, however, they have to replace four-year starter Dalianliz Rosado. That’s where CC McGraw will likely step in. The top-ranked libero in the 2018 class and 17th-best overall, McGraw enrolled early to compete during the spring. Her contributions might not be noticed as much as other players on this list, but could be a major factor into the Gophers ability to go deep in the tournament. The No. 17 Huskies are going to be one of the youngest teams in volleyball this season and also one of the most promising. That starts with Ella May Powell at the setter spot. The 26th-best recruit in the class, Powell is guaranteed to be the Huskies starting setter and is adept at defending at the net. The Huskies' five-member recruiting class ranks third in the country and Powell could be an All-Freshman team candidate at season’s end. Losing three of its top four hitters from last year’s team that finished 11th in the country, Kennedi Evans and Megan Yett will have plenty of chances as freshmen to contribute immediately for the No. 19 Utes. Evans, the 23rd-ranked recruit in the country, will factor into the rotation behind middle Berkeley Oblad. Yett, the 41st-best recruit, will help out on the outside to replace first-team All-American Adora Anae.